For the book based on the series, see Cosmos (book). "Cosmos (TV series)" redirects here. For the 2014 sequel series, see Cosmos: A Spacetime Odyssey. Cosmos: A Personal Voyage is a thirteen-part television series written by Carl Sagan, Ann Druyan, and Steven Soter, with Sagan as presenter. It was executive-produced by Adrian Malone, produced by David Kennard, Geoffrey Haines-Stiles, and Gregory Andorfer, and directed by the producers, David Oyster, Richard Wells, Tom Weidlinger, and others. It covers a wide range of scientific subjects, including the origin of life and a perspective of our place in the universe. The series was first broadcast by the Public Broadcasting Service in 1980, and was the most widely watched series in the history of American public television until The Civil War (1990). As of 2009, it was still the most widely watched PBS series in the world. It won two Emmys and a Peabody Award, and has since been broadcast in more than 60 countries and seen by over 500 million people. As of 2018, the entire series is being broadcast on a permanent loop on Twitch. A book was also published to accompany the series. Cosmos: A Personal Voyage has been considered highly significant since its broadcast; David Itzkoff of The New York Times described it as "a watershed moment for science-themed television programming". Cosmos was produced in 1978 and 1979 by Los Angeles PBS affiliate KCET on a roughly $6.3 million budget, with over $2 million additionally allocated to promotion. The program's format is similar to earlier BBC documentaries such as Kenneth Clark's Civilisation, Jacob Bronowski's The Ascent of Man, and David Attenborough's Life on Earth. However, unlike those series, which were shot entirely on film, Cosmos used videotape for interior scenes and special effects, with film being used for exteriors. The BBC—a co-producer of Cosmos—later screened the series, but the episodes were cut to fit 50-minute slots. Sagan in the series' final episode, "Who Speaks for Earth?" The series is notable for its groundbreaking use of special effects, which allow Sagan to seemingly walk through environments that are actually models rather than full-sized sets. The soundtrack includes pieces of music provided by Greek composer Vangelis, such as Alpha, Pulstar, and Heaven and Hell Part 1 (the last movement serves as the signature theme music for the show, and is directly referenced by the title of the fourth episode). Throughout the 13 hours of the series, many tracks from several 1970s albums are used, such as Albedo 0.39, Meddle, Spiral, Ignacio, Beaubourg, and China. The worldwide success of the documentary series put Vangelis' music in the homes of many, and brought it to the attention of a global audience. Turner Home Entertainment purchased Cosmos from series producer KCET in 1989. 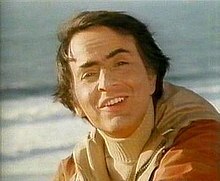 In making the move to commercial television, the hour-long episodes were edited to shorter lengths, and Sagan shot new epilogues for several episodes, in which he discussed new discoveries—and alternative viewpoints—that had arisen since the original broadcast. A 14th episode, consisting of an interview between Sagan and Ted Turner, was also produced. This new version of the series was eventually released as a VHS box set. This same re-edited version was also released on 12" LaserDisc. Two episodes were released per disc, one episode on each side. The LaserDiscs for the various episodes were sold separately, not in a boxed set (as was done for VHS). 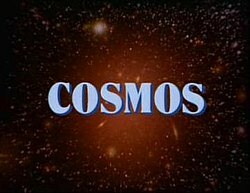 Cosmos was unavailable for many years after its initial release because of copyright issues with the soundtrack music, but when it was released in 2000 on worldwide NTSC DVD, subtitles in seven languages and remastered 5.1 sound were included, as well as an alternative music and sound effects track. In 2005, The Science Channel rebroadcast the series for its 25th anniversary, with updated computer graphics and film footage, digital sound, and information about relevant scientific discoveries in the intervening 25 years. Despite being shown again on the Science Channel, the total amount of time for the original 13 episodes (780 minutes) was reduced 25% to 585 minutes (45 minutes per episode) in order to make room for commercials. In a 2009 UK release, Fremantle Media Enterprises digitally restored and remastered the original series as a five-disc DVD set which included bonus science updates. "Travellers' Tales" redirects here. For British video game developer, see Traveller's Tales. Carl Sagan opens the program with a description of the cosmos and a "Spaceship of the Imagination" (shaped like a dandelion seed). The ship journeys through the universe's hundred billion galaxies, the Local Group, the Andromeda Galaxy, the Milky Way, the Orion Nebula, our Solar System, and finally the planet Earth. Eratosthenes' successful calculation of the circumference of Earth leads to a description of the ancient Library of Alexandria. Finally, the "Ages of Science" are described, before pulling back to the full span of the Cosmic Calendar. Note: the revised version of the series adds an introduction by Ann Druyan to this episode, recorded after Sagan's death, in which she discusses some of the changes that occurred in the years after its broadcast. Sagan discusses the story of the Heike crab and artificial selection of crabs resembling samurai warriors, as an opening into a larger discussion of evolution through natural selection (and the pitfalls of intelligent design). Among the topics are the development of life on the Cosmic Calendar and the Cambrian explosion; the function of DNA in growth; genetic replication, repairs, and mutation; the common biochemistry of terrestrial organisms; the creation of the molecules of life in the Miller–Urey experiment; and speculation on alien life (such as life in Jupiter's clouds). In the Cosmos Update ten years later, Sagan remarks on RNA also controlling chemical reactions and reproducing itself and the different roles of comets (potentially carrying organic molecules or causing the Cretaceous–Paleogene extinction event). The journeys of the Voyager probes is put in the context of the Netherlands in the seventeenth century, with a centuries-long tradition of sailing ship explorers, and its contemporary thinkers (such as Constantijn Huygens and his son Christian). Their discoveries are compared to the Voyager probes' discoveries among the Jovian and Saturn systems. In Cosmos Update, image processing reconstructs Voyager's worlds and Voyager's last portrait of the Solar System as it leaves is shown. Ideas about time and space are explored in the changes that constellations undergo over time, the redshift and blue shift measured in interstellar objects, time dilation in Albert Einstein's theory of relativity, the designs of both Leonardo da Vinci and spacecraft that could travel near light speed, time travel and its hypothetical effects on human history, the origins of the Solar System, the history of life, and the immensity of space. In Cosmos Update, the idea of faster-than-light travel by wormholes (researched by Kip Thorne and shown in Sagan's novel Contact) is discussed. Beginning with the origins of the universe in the Big Bang, Sagan describes the formation of different types of galaxies and anomalies such as galactic collisions and quasars. The episode moves further into ideas about the structure of the Universe, such as different dimensions (in the imaginary Flatland and four-dimensional hypercubes), an infinite vs. a finite universe, and the idea of an oscillating Universe (similar to that in Hindu cosmology). The search into other ideas such as dark matter and the multiverse is shown, using tools such as the Very Large Array in New Mexico. Cosmos Update shows new information about the odd, irregular surfaces of galaxies and the Milky Way perhaps being a barred spiral galaxy. Questions are raised about the search for intelligent life beyond the Earth, with UFOs and other close encounters refuted in favor of communications through SETI and radio telescope such as the Arecibo Observatory. The probability of technically advanced civilizations existing elsewhere in the Milky Way is interpreted using the Drake equation and a future hypothetical Encyclopedia Galactica (similar to Rosetta Stone) is discussed as a repository of information about other worlds in the galaxy. The Cosmos Update notes that there have been fewer sightings of UFOs and more stories of abductions, while mentioning the META scanning the skies for signals. Sagan reflects on the future of humanity and the question of "who speaks for Earth?" when meeting extraterrestrials. He discusses the very different meetings of the Tlingit people and explorer Jean-François de La Pérouse with the destruction of the Aztecs by Spanish conquistadors, the looming threat of nuclear warfare, and the threats shown by the destruction of the Library of Alexandria and the murder of Hypatia. The episode ends with an overview of the beginning of the universe, the evolution of life, and the accomplishments of humanity and makes a plea to mankind to cherish life and continue its journey in the cosmos. The Cosmos Update notes the preliminary reconnaissance of planets with spacecraft, the fall of the Berlin Wall and the end of apartheid in South Africa, and measures towards the reduction of nuclear weapons. Some versions of the series, including the first North American home video release (though not the DVD release), included a specially-made fourteenth episode, which consisted of an hour-long interview between Sagan and Ted Turner, in which the two discussed the series and new discoveries made in the years since its first broadcast. 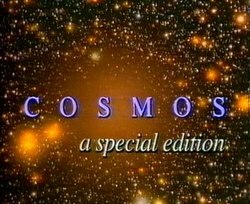 The 1986 version of Cosmos contains a mix of music used in the original version, with a unique soundtrack composed by Vangelis specifically for the special edition. The score is often referred to as Comet, as "Comet 16" is used during the opening and closing credits of each episode. Of the 21 cues, "Comet 16" is the only one that has been officially released, although some of the new music appears in the 2000 remastered DVD release. In 1981, a soundtrack LP was released by RCA Records shortly after the series' airing, which included the signature theme "Movement 3" (from "Symphony to the Powers B" from the album Heaven and Hell) by Greek synthesist and composer Vangelis (catalog No. ABL 1–4003 and TMS-50061; both also released on cassette tape). In 1994, RCA Records reissued the original soundtrack compilation on compact disc and, in 2002, reissued it on its Collectables label (RCA 07863 54003-2 USA; Collectables COL-CD-6293 USA). In 2002, a special two-disc "collector's edition" of music from the series was released to coincide with the DVD reissue, containing complete versions of many of the songs from series only available as snippets on previous releases. The main theme, titled Heaven and Hell, Part 1, but edited from Heaven and Hell Part 1 3rd Movement, was released in the UK as an edited 7" single by BBC Records (Cat No: BBC1). The 7" single did not have the quiet keyboard intro to be found on the full Vangelis LP version originally released in 1975. The B-side of the 7" single was an edited version of Alpha, taken from the Vangelis LP Albedo 0.39. On August 5, 2011, plans were announced for a sequel to the series, bringing up-to-date special effects and scientific discoveries to the themes and messages of the original series. The new 13-part series, referred to as Cosmos: A Spacetime Odyssey, was originally announced to premiere in the 2012–13 United States network television schedule, but a Twitter update from Neil deGrasse Tyson in June 2012 indicated a Spring 2014 release. Episodes began airing March 9, 2014 on the Fox Network and the next day on National Geographic Channel. The new series was hosted by astrophysicist Neil deGrasse Tyson and produced by the two surviving original creators, Ann Druyan and Steven Soter, with Seth MacFarlane. ^ "StarChild: Dr. Carl Sagan". NASA. Retrieved October 8, 2009. ^ "Carl Sagan". EMuseum@Minnesota State University. Archived from the original on May 28, 2010. Retrieved October 8, 2009. ^ "Some of the missing scenes from Cosmos episode 2". June 17, 2008. ^ "Various – The Music Of Cosmos". Discogs. Retrieved April 20, 2014. ^ a b "Various - The Music Of "Cosmos": Selections From The Score Of The Television Series "Cosmos" By Carl Sagan". Discogs. ^ "Library of Congress Officially Opens The Seth MacFarlane Collection of Carl Sagan and Ann Druyan Archive". News from the Library of Congress. Retrieved November 12, 2013. ^ Wallenstein, Andrew. "TCA: Fox aims for repeat-free sked". Variety. Retrieved October 29, 2012. ^ Blum, Matt (August 5, 2011). "Cosmos Will Get a Sequel Hosted by Neil deGrasse Tyson". Wired. Retrieved August 5, 2011. This page was last edited on 2 January 2019, at 17:26 (UTC).